Mailchimp Subscribe for iPad provides design tools to customize the look and feel of your forms. 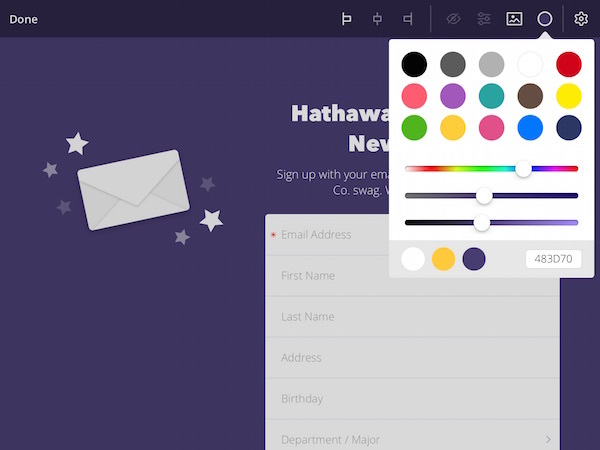 You can choose the layout of your form, use your own logo, and manage the form's fonts and colors. In this article, you'll learn about Subscribe's design tools and how to customize the look of your forms. Before you can customize a form's design, create a form in Mailchimp Subscribe. You can't add, delete, or edit list fields in Mailchimp Subscribe. Any changes to list fields must be made in your Mailchimp account. To sync your contacts properly, any fields that are required in your Mailchimp list must be required on your Subscribe signup form. We'll save all your changes automatically as you edit your form. You can customize the background and layout of your form, change the logo, and edit the font styles and form field settings. When your form is in Edit mode, the design toolbar appears at the top of the screen. The tools available to edit your background and layout display by default. 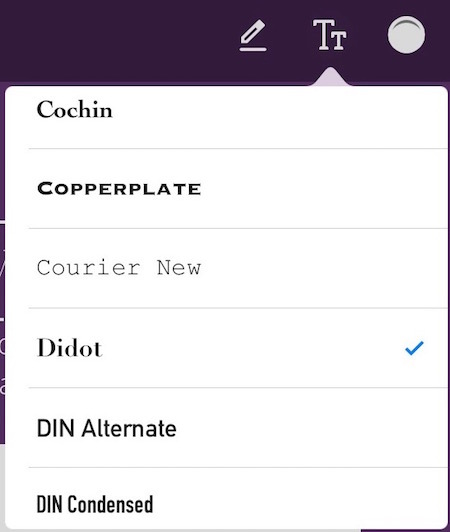 Tap any element on your form to open the customization tools for that element. To edit a form, locate the form you want to work with on the Forms List, and tap Edit in the lower-right corner of the form. To customize the background of your form, you'll choose an image from your device or use Subscribe's color picker to set a background color. In landscape mode, you can edit the layout of your form, so your logo appears on the left, centered above your form, or to the right. In portrait mode, the logo always displays centered above your form. To customize the background and layout for your form, follow these steps. To change the location of your logo, tap the Format icons in the toolbar at the top of the page. Tap the Image icon in the toolbar to select a background image for your form, or tap the Circle icon to choose a background color. Adjust your color with the horizontal sliders, or tap the text box in the lower-right corner to enter a hex color value. Tap the Image or Circle icon again to close the menu. To change your form logo from Mailchimp Subscribe's default image, follow these steps. Tap the image to edit it. Tap the Show icon in the upper-right corner to hide the image, or tap the Image icon to choose an image from your device. When you're done, tap the checkmark in the upper-left corner. To edit the the form title, subtitle, and subscribe button, follow these steps. Tap the element you want to work with. Tap the Pencil icon in the upper-right corner and delete the default text. 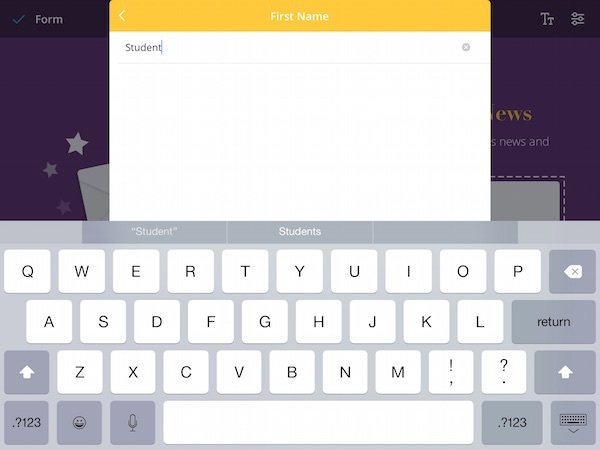 Type your content in the text box, and tap the Pencil icon again to close the text box. We'll save your changes automatically. Tap the Text icon to choose a font, and tap the Text icon again to close the menu. Tap the colored circle next to the Text icon to choose a font color. If you're editing the Subscribe button, you'll see two colored circles. 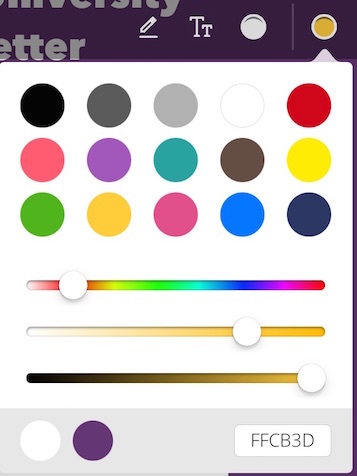 Use the circle on the right to choose a background color for your button. Tap the Circle icon again to close the menu. Tap the checkmark in the upper-left corner to exit. To edit the font used in your form fields, or other field settings like visibility, follow these steps. 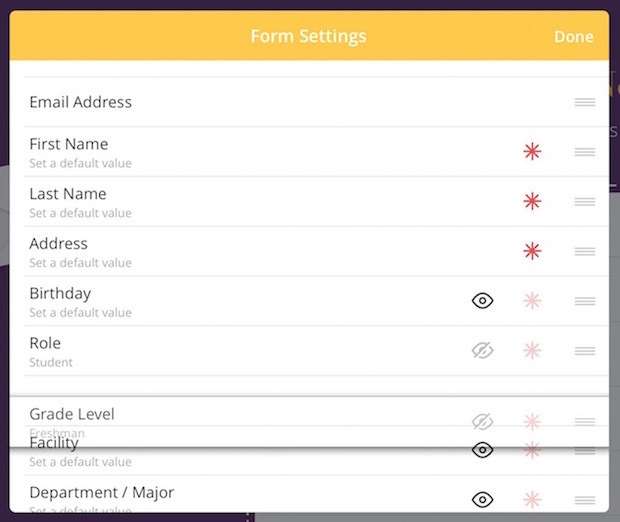 Tap any field on your form to edit the form field settings. 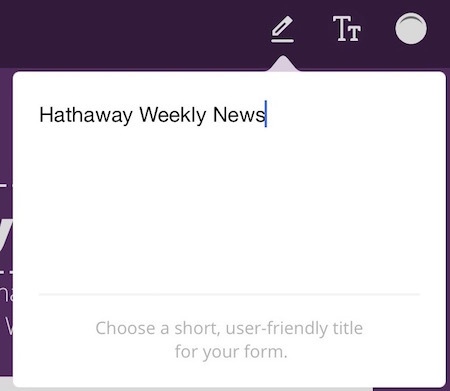 Tap the Text icon in the upper-right corner to choose a font for the form field text. Tap the Text icon again to close the menu. 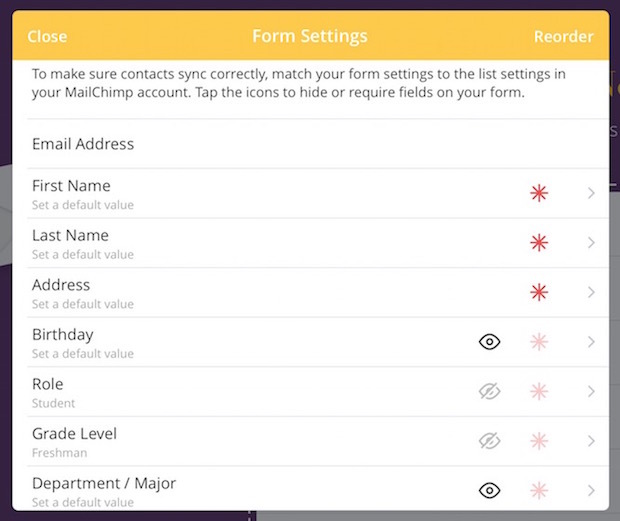 Tap the List icon to edit the settings for your form fields. In the pop-up modal, tap the View icon for any field to make it hidden or visible on your form. Tap the red asterisk for a field to make it required. Make sure all fields that are required in your Mailchimp signup form are also required on your Subscribe form. To reorder your form fields, tap Reorder in the upper-right corner, then tap and hold the three horizontal lines icon for any field to drag it to a new location. To enter a default merge value for a field, tap the name of the field, and input a default value in the text box. Tap the back arrow to return to your form field. With Mailchimp Subscribe you can control subscription from your iPad. Learn about how to view data, export signups, and change settings. Having trouble with the Mailchimp Subscribe app for iPad or Android? Learn about common issues and how to fix them.